We have found some strange and sentimental stuff in the bins we service over the years, but nothing sadder than 4 abandoned kittens we found in one of our bins on a wet, cold day. If you are anywhere near the Niagara region, you surely heard about this all over the news. Our on-call director received a frantic alert at 3:00 am from maintenance staff with a photo attachment. 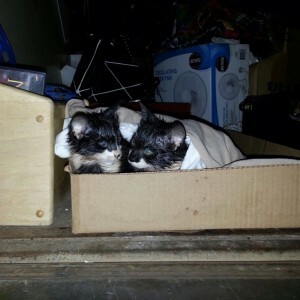 Our staffer had found two more kittens wet and shivering inside a bag. They were quiet but seemed okay. He immediately called the LCHS, found a box, filled it with warm blankets and placed the kittens inside, wrapped them in more blankets and put them on the truck away from the elements until help arrived. The TWD office was abuzz with kitten talk and our President, an animal lover, was outraged and offered a $500 reward for any information leading to an arrest. We contacted CCSF and promised to cover all the adoption fees and start up goods. It’s animal adoption month in the Ontario. 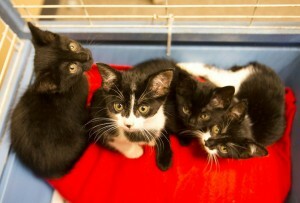 It cost only $100 to cover the adoption fees for all four kittens, so we decided to sponsor eight adoptions in total. Then TWD’s President sent us on a shopping spree. We wanted to make sure that kittens, who were named Charity, Dodger, Faith and Hope, had all the necessary items to get a good headstart in their new homes. They each got a kitten starter kit that includes colour coordinated litter, liner, scooper, cat bowls and a water dish. 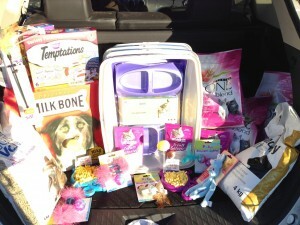 They also got a bag of litter, kitten kibble, treats, and two really cool toys. We were saddened to hear that less than a week after our kittens had been abandoned, a pet rabbit was found abandoned in a garbage dumpster and now was also staying at the shelter, so we brought him a big bag of food too. We also bought a big box of cookies and lots of cat treats for all the other animals staying at the shelter. The best news of all, is that all four cats now have new homes! They were adopted by two wonderful families, so that they wouldn’t be totally separated. Charity and Dodger were found and adopted together first by lovely M. Faith and Hope were found and adopted together soon after by the miracle D. We are so grateful to both families for opening your hearts and homes to these beautiful creatures. We wish you all abundant love and happiness! Please send us pics! Friendly reminder: Nothing warms a heart more than the love of an animal. We were at the Lincoln County Humane Society today dropping off all the goodies, and they have A LOT of animals staying at the shelter that would make a lovely addition to any family. Their adoption fees are very affordable, and spay/neuter is included with it. We urge you to consider sharing your life with a shelter animal or consider making a donation to help them with all the great work they do. Not So Friendly Reminder: The bins we service are very busy, and abandoning an animal in one is cruel, painful and very dangerous. It is literally a miracle these kittens survived. Used clothing donation bins are for TEXTILES ONLY. Abandoning an animal is a criminal offence, and in a clothing donation bin, it’s just plain cruel, not only for the cats, but also upsetting and potentially dangerous for our staff. Don’t do it, period. < Thanks for a Great Waste Reduction Week!